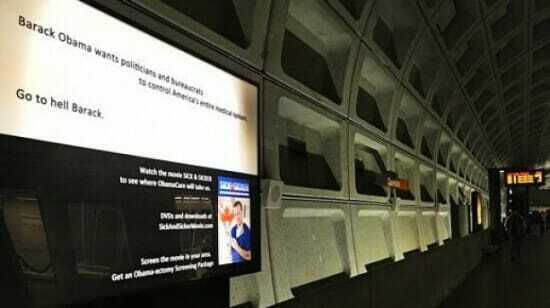 A new DC Metro ad criticizing nationalized health care telling Barack Obama to “go to hell” has liberals upset in Washington. In the heat of a US presidential election year, with Americans immune to the polarized and bitter nature of political discourse, it takes a lot to shock them, especially in Washington. But one ad at a DC Metro station — which starts off criticizing Obama’s health care reforms and ends up telling the president to “go to hell” — goes beyond the pale, says Jim Moran, a Democratic congressman from Virginia. The advertisement is for “Sick and Sicker: When the Government Becomes Your Doctor,” a documentary that interviews Canadian doctors and patients in the hope of showing how dangerous “Obamacare” is for the American people. “Barack Obama wants politicians and bureaucrats to control America’s entire medical system. Go to hell Barack,” the ad says. Moran wrote a letter to Metro general manager Richard Sarles calling for the removal of the advertisement. “The ad is deeply disrespectful of the President of the United States and does not belong in the Washington Metropolitan Area Transit Authority (WMATA) network,” he wrote.